Leaves: Arising from short, stout bases, stalks to 6 inches long; blades 1 to 3 inches long, 1 to 4 inches wide, glabrous or pubescent, shallowly to deeply palmately 3-lobed, each lobe sometimes cleft again, these subdivisions often divided once more into 2-4 segments; margins fringed with hairs. Inflorescences: Solitary flowers, terminal, stalks 1 to several, smooth, usually rising above leaves. Flowers: Showy, violet; sepals 5, lanceolate; petals 5, 1/2 to 3/4 inch long, lower 3 petals with white bases, dark purple veins, densely bearded, lowest petal spurred; stamens 5, yellowish; inconspicuous, non-opening, self-pollinating flowers also occur on shorter flower stalks. Fruits: Capsules, egg-shaped, smooth, yellowish; seeds many, tan. Habitat: Prairies and open woodlands. Distribution: East 2/5 of Kansas. Comments: The epithet pedatifida is from Latin "foot" and "cleft", a reference to the appearance of the leaf. 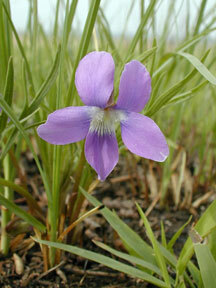 Viola species frequently hybridize, making identification difficult.